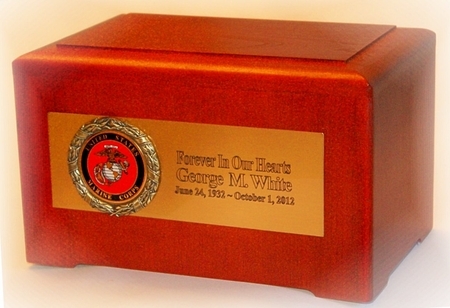 This solid wooden cremation urn is an honorable tribute to any Army, Navy, Air Force or Marine service member or veteran. It has a cherry stained finish over real wood and is decorated with a military medallion of your choice and a brass plate engraved to your specifications. Engraving is included in the price and you can call us with details or simply put the engraving you want under your email address in the "engraving" section when you checkout. The appearance is elegant and discreet and styled after the Early American type of wooden furniture handmade made by craftsmen in the beginning of the 20th Century. It has a capacity of approximately 230 cubic inches so that it can serve as a large single urn.